In 1855 Henry W. Wheeler famously walked from St. Paul to Oneota and, with machinery shipped from Detroit, built the first sawmill in what would become the city of Duluth along the bay at about Forty-Fourth Avenue West. Pioneers J. 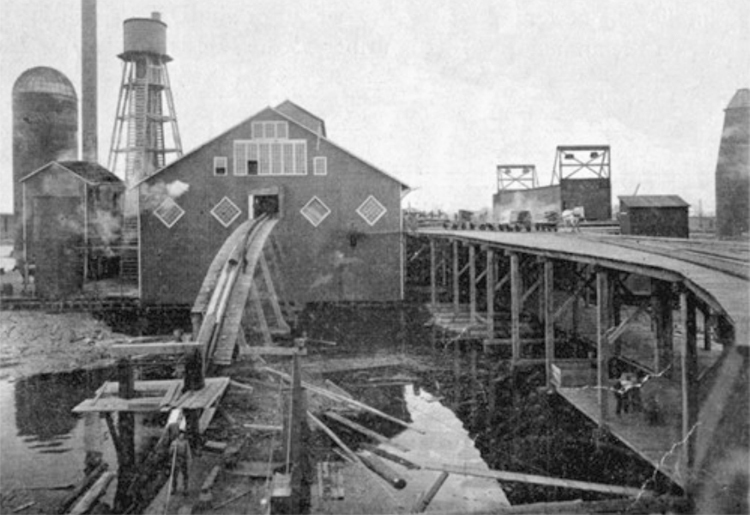 B. Culver and William Nettleton started the first sawmill in Duluth Township. The Wheeler mill burned in 1870, two years after it halted operation. By then mills had popped up on western Lake Superior’s shores wherever log rafts, and later trains, could reach them — on the north shore from Duluth to Beaver Bay and along the south shore from Superior to Ashland. Historian Dwight Woodbridge reported that in 1894 the following firms were operating sawmills in Duluth: Mitchell & McClure; Merrill & Ring Lumber Company; Duncan, Brewer & Co.; J. B. Stevens; Peycott, Kimball & Barber; C. B. Murray and Co.; B. B. Richards Lumber Company; Hubbard & Vincent; W. P. Heimbach; Scott-Holsten Lumber Company; Howard Lumber Company; M. Carrol; and Herman Becklinger. In northern Wisconsin, nine mills operated out of Washburn, Bayfield, and Ashland alone; it was said that the sawdust generated by the mills covered all of Chequamegon Bay. In the 1880s area mills produced an average of 10 million board feet a year; in 1890 they produced 150 million feet. By 1894 thirty-two mills employed 7,700 in Duluth and Superior — and more mills operated along the western Lake Superior shores. Twin Ports milling peaked in 1902, when 443 million board feet were produced. During the first ten years of the twentieth century over 3 billion board feet of lumber came out of Duluth’s mills, but just over 1 billion feet was cut from 1910 to 1921, that year many declared the industry played out. Indeed, the sawmilling industry had been in decline since at least 1910, when operations in Duluth dropped to just six major sawmills. Lumber mills operated as close as they could to lumber camps, and by then most of the old growth forests in the area had been cleared; it no longer made sense to operate a mill in the Zenith City. 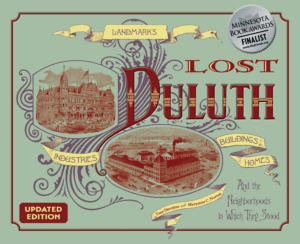 In 1922 only one mill operated out of Duluth; by 1927 it was gone. Logs reached the mills either by rail or water, and the mills converted the raw material into lumber. The logs were placed into a barker, a machine which stripped off the bark. Once stripped, sawyers ran the logs through a variety of saws, starting with the double gang, a large set of parallel blades powered by water that sawed the logs into boards. Gate saws (sometimes called sash or frame saws), which sat in a frame and moved up and down by power generated from the mill’s waterwheel, were also used. (A gang saw was a set of gate saws working in unison.) Ripsaws cut the boards to narrower widths. The edgerman trimmed the boards’ edges, which afterward were cut to length with a cutoff saw. In the industry’s early days, lumber was cut manually using whipsaws or pit saws, which were operated by two men, one of which literally stood in a pit while sawing; each board was cut individually. All the saws were maintained by the filer, highly skilled at sharpening saw blades. Finally the boards were placed in a large shed called a drying kiln where steam heat dried them out. After the lumber had dried, off-bearers carried the finished product away to the lumberyard, where it awaited transport by train or ship. Newly married and graduated from the University of Michigan, young Zar D. Scott brought his bride to Duluth in the 1870s, where he used “a wheelbarrow and a rowboat to haul materials from the wilds of Park Point to his shop.” In 1879 he and David Holsten began operating a sawmill on Lake Avenue South, forming Scott-Holsten Lumber. In 1890 the firm acquired the Graff Little Company, closed its mill, and moved into a new Scott-Holsten mill near Twenty-Fourth Avenue West and Michigan Street. There the firm built a drying kiln, sash and door plant, office building, and warehouse. Besides those who worked the mill the firm employed five hundred men in lumber camps. At its peak the mill cut 6 million board feet per year. The company changed its name to Scott-Graff in 1900 and, like other area mills, gradually withdrew from logging and sawmill activities. Working with the University of Minnesota in 1908, Scott-Graff became a pioneer in reforestation when it seeded and hand-planted 142,250 white pines, 3,100 white ash, 41,750 Norway spruce, and tens of thousands of other species on lands its logging operations had cleared of old-growth timber. By 1927 the sawmill had shut down and Scott-Graff turned its focus to millwork. As World War II began, Scott-Graff concentrated on government defense contracts to build wooden invasion barges and ammunitions boxes. The company’s support of the war effort earned it an “M Pennant” from the U. S. Maritime Commission. Pacific Mutual Door Company purchased Scott-Graff in 1967 and the Duluth plant became a distribution warehouse. In 1978 Pacific Mutual closed the plant and sold the property to the Duluth Transit Authority which demolished the Scott-Graff buildings and built a bus maintenance facility. In 1890 Jethro Mitchell of Cincinnati, Ohio, and William C. McClure of Saginaw, Michigan, invested in a sawmill in Duluth to cut lumber being harvested in northern Minnesota. Mitchell remained in Cincinnati, but McClure moved to Duluth, setting up housekeeping in the Spalding Hotel and later established an office in the Lyceum Theatre building across the street. When the Mitchell & McClure Sawmill opened in 1891 at Fifty-First Avenue West along the bay, its owners claimed it was the largest in the world, with a 2,400-foot dock to serve cargo ships. While the impressive facility was outfitted with the latest machinery, the mill was second in capacity in the United States at the time, just shy of that of the Young Mill in Clinton, Iowa. Still, it could produce over 3 million board feet of lumber in one week. In 1894, at the peak of the Minnesota logging industry, Mitchell and McClure employed 200 workers in the West Duluth mill and 450 loggers in the woods. The company built sixty houses and a boarding house near the sawmill for employees. In 1903 the Alger Smith Company purchased and took over the mill’s operation. In September 1920, with the clearing of most of the white pine and the decline in the lumber industry in northern Minnesota, the sawmill was dismantled. According to a newspaper story about the mill’s demolition, much of the lumber from the sawmill was sold to individuals who used it to build garages in West Duluth. A paper plant was built on the site in 1988. The Duncan Brewer Sawmill was established in Duluth in 1887 and in 1892 built a sawmill at Thirty-Ninth Avenue West. In 1902, having run out of lumber to cut, the mill was purchased by the Red Cliff Lumber Company. Red Cliff operated the mill until it closed in 1913. Huntress & Brown set up shop on Grassy Point in 1890, but only lasted sixteen years. Grassy Point was also the site of Merrill & Ring, another former Michigan outfit that moved to Duluth after running out of lumber in Michigan. Like many other sawmills, Merrill & Ring invested in more than just their sawmill. In 1899 the firm established the Split Rock Lumber Company to hire lumberjacks to harvest an estimated 200 million board feet of timber on land it had recently purchased. It then built a logging railroad to bring the logs to the mill on St. Louis Bay.